CCCS, Inc.™ has been a pioneer in many different aspects. In 1996, CCCS, Inc.™ became one of the first institutes in the U.S. to teach healthcare interpreting. Our healthcare interpreting program was the result of many years of interpreting experience by CCCS Inc.”s™ founder and President Zarita Araujo-Lane, LICSW. Drawing on her experience in combination with her team that includes providers, interpreters and educators, she developed a unique program that included many firsts for the industry. Here are a few examples of how CCCS, Inc.™ has proved to be an industry leader. CCCS, Inc.™ is a WBE, DBE and PBE certified PRF63 vendor with the Commonwealth of Massachusetts. This contract covers Foreign Language Interpretation and Translation. Simultaneous Interpretation Services & Equipment, Voice-over Services and Over the Phone Interpretation (OPI) are available outside the scope of PRF63. For more information regarding PRF63, please visit CommBuys. Cross Cultural Communication Institute (CCCI), a division of CCCS, Inc.™, became the first licensed postsecondary school for interpreters in NH and possibly nationwide. In addition, CCCI is in the process of applying for the same status in Massachusetts. CCCS, Inc.™ was one of the first companies and training institutions to introduce the concept of Language Coaches to the industry. Language Coaches are active experienced interpreters that work with students in small group settings where all of the students speak the same target language. Language Coaches are a key component of the course as they give personal attention to each member of the group and provide guidance and feedback to help the student improve their skills. CCCS, Inc.™ has developed a training manual for their language coaches and by the end of 2011, both training and manuals will become available to the general population. CIFE is an acronym that interpreters use to set the stage in a triadic encounter. This acronym is a collection of tools that help the interpreter avoid difficult situations that might occur with either the provider or patient. This tool is comprised of an introduction and oral agreement with all parties and it helps to set the stage so that all parties are aware of how the session will proceed and what guidelines will be used. Anchoring is a memory aid or a tool that allows interpreters through the help of the speaker to recall part of the message that may have been lost or forgotten. This tool is much quicker than simply asking the speaker to repeat themselves, and also distinguishes the professional interpreter from the ad hoc interpreter. Partner and Set the Tone are acronyms created by CCCS, Inc.™ and are useful for Providers working with the LEP population. By means of these acronyms, providers are given the tools to help them understand some of the challenges that a LEP individual may face and at the same time encourages the provider to view the situation from the patient’s perspective. This is essential to a successful triadic encounter as many of the cultural beliefs held dearly to by the patient, may seem illogical to someone who is only familiar with western ideas and culture. Rather than judging the patient or their values and beliefs, the provider needs to be respectful and treat the patient according to the framework that the patient outlines. When this is done, patients are more likely to feel an attachment to that provider and institution, thus resulting in overall higher patient satisfaction. 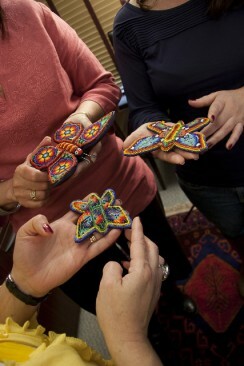 CCCS, Inc.™ uses the butterfly as a symbol of the complexities of the interpreter’s role. As the body, or center, of the butterfly, the interpreter is the linguistic and cultural connection between the provider/customer and the patient/client. The interpreter keeps both wings in balanced interaction, gaining strength through trust, and the interpreting session takes off. As the profession is still evolving CCCS, Inc.™ has provided freelance interpreters with a tool called the 6 Ws. This is used to assist freelancers as they try to navigate through difficult ethical gray areas. This model is a concrete way of bringing one to a center a zone where one cannot always show respect as respect may mean different things for different people. All individuals have honor, respect, generosity and trust. These qualities can be portrayed as a tree. This model helps individuals to see that their perception of things may vary greatly from that of the other person. It also illustrates that sometimes our actions even though they are well intentioned may produce a negative effect. Immigrants in general come to a new country due to political, financial and geographic reasons. It takes five to ten years for an immigrant or refugee to be able to get to the USA. There is a lot of personal, family and financial sacrifice for the sake of finding a better life. The emotional life of the immigrant does not uniformly entail falling in love with the new country and discarding the old. It is not uncommon for immigrants to silently go through the following grieving stages: Honeymoon, Anger- Loss and Negotiation – Acceptance. This model helps individuals to understand the effects of immigration and how they impact the new-comer.